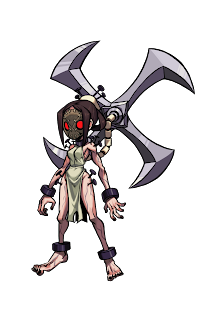 Recently Autumn Games & Reverge Labs revealed the latest character in their upcoming fighting game Skullgirls – the ferocious Painwheel!. Read a little back story on the new character below! Once a normal schoolgirl named Carol, Painwheel was kidnapped by Valentine and delivered to the Anti-Skullgirls Labs’ secretive Lab Zero. There she was implanted with the synthetic Buer Drive and Gae Bolga parasites and infused with experimental Skullgirl blood, transforming her into the monster she is today. Violent and unstable as a result of these experiments, as a precaution she’s mentally controlled by Lab Zero’s powerful psychic director, Brain Drain.